An appealing and comfortable space for your clients is essential for an optimal massage experience, so what can you do to ensure your massage space reflects the tranquillity and peace that you want your clients to enjoy? Start by making sure that you have vital elements such as storage and screening, and invest in some attractive (yet subtle) décor to lift the mood of the space. Your massage room should be large enough to comfortably accommodate a standard massage table (measuring around 70 cm by 200 cm). You should have at least 90 cm around the table to move around and work in. In addition to this, you’ll need some storage space, an area for a sink and counter, extra floor area for a seating area, and enough room for the door to open and close. In all, you might need 13 square metres or more for your new massage room. Neutral, earthy tones might be best for your massage space, as bright and dark colours can affect relaxation and be too stimulating. Think of the senses when decorating and adding elements to your massage room. Touch and feel – Comfortable sheeting for your massage table and soft area rugs can heighten your client’s comfort levels. Additionally, your room should be kept at a comfortable temperature. Sight – Scenes of nature make wonderful additions to massage rooms because they can help clients relax, rather than being points of attention in themselves. Another idea is to hang reflexology and human anatomy charts or massage-themed diagrams to highlight the theme of the room. Less obvious elements such as metal tables and glass cabinets can make the room feel ‘hard’, so use natural accents such as stone, fabric, wood, and wicker where possible. Smell – Scented candles with natural essential oils rather than artificial scents can subtly lift the mood of the room. Other options include essential oil burners, fresh flowers, or reed scent diffusers and scented sticks. 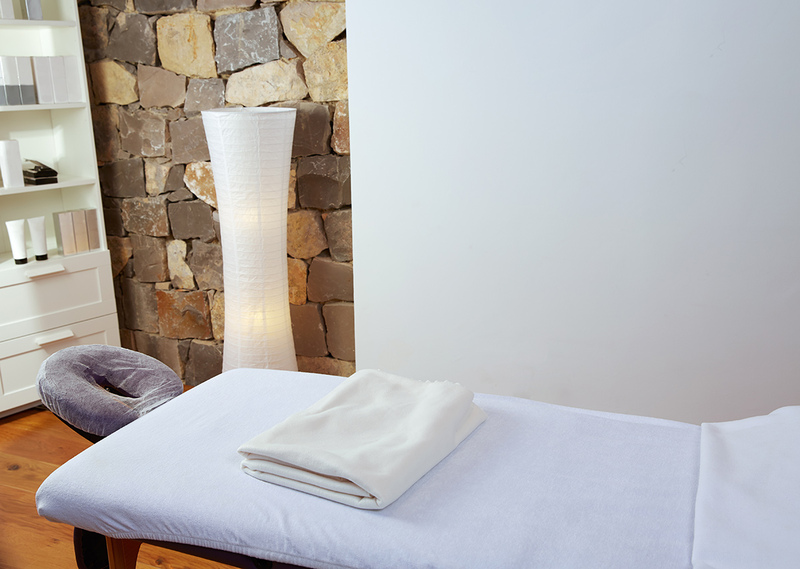 Sound – Your massage room should be in a quiet location without excessive traffic sounds and other noises. If you’re located in a busy area, look for ways to soundproof your room, such as double glazing windows and applying seals to your doors. Music is an essential component of massage therapy for many people, so add speakers and load your digital music player with some suitably relaxing playlists. The sound of flowing water can be relaxing for some, so consider using a small desktop fountain or a larger water feature. Rather than hard surfaces, it might be a good idea to go with wood, vinyl tile, or other cushioned flooring. Alternatively, if you have hard flooring such as marble tiles, you can soften the floor with carpet or rugs. Make sure you have plenty of storage for all your equipment and supplies, as visual clutter can impact your client experience. Closed storage cabinets are a good idea for things you don’t need immediate access to, but you might want to have some open shelf storage for things you need to use during massage sessions, such as oils and lotions. Large mirrors, especially wall-to-wall ones, can make rooms feel much larger than they are. You can also hang up a smaller wall mirror near the entrance, to allow clients to check their appearance after a massage before they leave. Dimming the lights can help clients relax and create a beautiful ambience. Make sure you can control the level of lighting in the room by having blinds that block out any sunlight from the window, as well as adjustable lamps and overhead lighting. Use warm-coloured light bulbs rather than white lighting to warm the room and avoid a sterile look. Add some seating for your clients as they will need to sit down while removing shoes and clothing. They will also need a place to keep their bag during the massage, and your seating area can double as this space if your room has space constraints. Add a barrier, such as a screen, to give clients more privacy while they’re getting changed. You’ll probably also need to have a small chair or stool with wheels that you yourself can use during the massage. Usually the massage table is positioned at the centre of the room, thereby creating a focal point. Experts suggest that the head of the massage table should be the farthest thing away from the entrance to the room, as this creates a feeling of safety and security for clients. Leaving sufficient space around each area in your massage room can avoid the feeling of clutter. Once you’ve furnished your room, walk around the space and work out the key routes that you and clients will be using. Make sure you’ll have plenty of space to walk around within these routes. These extra touches will boost your credibility and enhance the energy and feel of your massage room. Keep it clean – Keeping your massage space immaculately clean communicates professionalism and quality to your clients. Make sure your room is vacuumed, dusted, and spotless at all times. Credentials – Establish credibility by displaying your credentials; for example, with a framed certificate at the entrance. Quality sheets and towels – Invest in some high thread count sheets, along with soft, quality pillows to boost comfort for clients. When it comes to designing your massage room, less is definitely more. As long as you avoid clutter and start with comfort in mind, you’ll be able to design a beautiful, well-functioning space that supports maximum relaxation for your clients.